Special price $10 for 10 first sales! 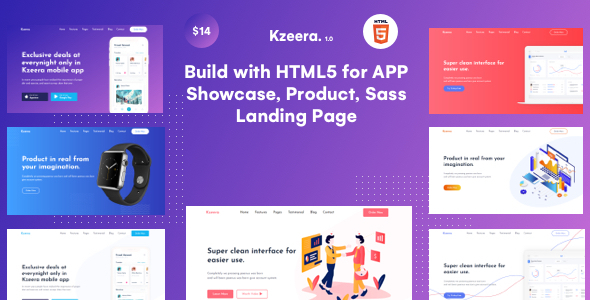 Kzeera is a solution solving based App Landing Page HTML5 Template. They need a design that can makes something different, something out of the box but it should be minimal and user-friendly. . Kzeera can be used for the Product landing page, Software landing page, Sass landing page, App landing page, App showcase, Apps,APP, SaaS, Mobile app, Startup & Software, app landing, app landing template, App Showcase, app store, app template, app website, clean app landing, creative app landing page, landing page, mobile app landing page & modern app Landing. etc.